The backsplash area behind the kitchen stovetop needs special design consideration. This area must handle grease and heat, be easy to clean and it also must tie together the design of the kitchen as a whole. Simple high gloss paint cannot do all of these things as well as other materials. 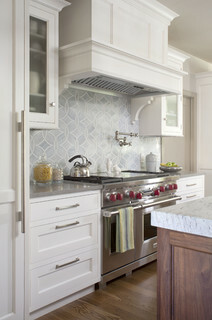 The area behind the stove top, most of the time, looks best when it is different than the backsplash under the counters. When picking out a good material always consider your cabinet color, wall color, and the amount of light your kitchen gets. If the kitchen has dark cabinets, accent them rather then match them. Why are these good stove backsplash ideas? These materials do not have large pores, are very hard, are heat resistant, and are easy to clean. Specific kinds of Natural Stone, Honed, Polished, and Sealed. Wallpaper is not a good stove backsplash idea. Flat paint is also not easy to clean. Rough stone, like brick, that will collect grease in tiny crevices and pockets is better to avoid if desiring easy to clean, less maintenance stove backsplash. Soft stone, like sandstone, that cannot withstand harsh chemicals and hard scrubbing. Some limestone types are too soft and have too many pores to be good long term solutions. Tumbled marble can also be an issue. Some find it fine, as they always clean off any acidic foods right away, but there is a risk of staining, especially if the sealer gets thin.